I received these two strops from paciccio (Fabrizio) in Milano, Italy. Now I cannot compare these to two of the big names in strops, Tony Miller from the USA and Neil Miller from the UK, but I can compare them to what I have used and know, and that is the Illinois Strops. IMHO these two paciccio strops are superior to any Illinois Strop that I have used. These are handcrafted in Milano, Italy by Fabrizio and you can see and feel the artist touch. I think the best way to describe them is just to use the artist words, as he sent them to me. Translated by Fabrizio. This one is made in Calf Leather and Cashmere. to prepare the blade to the Calf Leather side. This sequence is specifically designed for bring your edge to the maximum smooth. For the other one the principle of operation is similar to the previous. 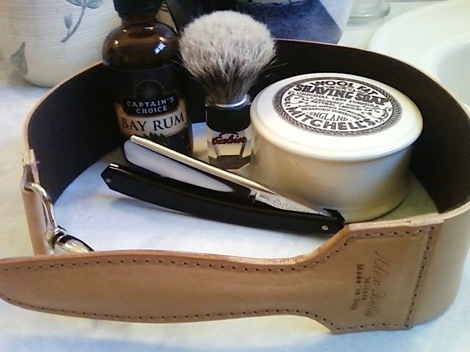 is for prepare the blade for the shave. 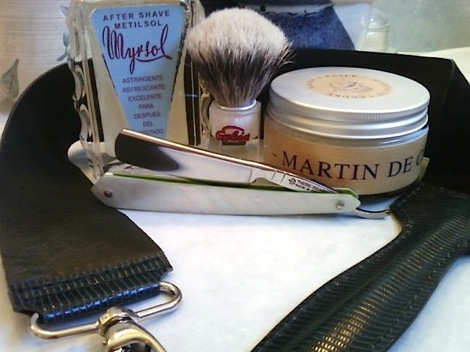 This special strop has the best performance, with well sharpened razor, the specialty is the elasticity. The Reptile Handle is a special touch. Both of the above are 2 1/2" wide. My photos do neither of these strops justice. They are very well made and the craftsmanship shows. I now have these strops in my possession and can state these are insanely wonderful strops. The craftsmanship is incredible, anyone would be well served to purchase one of these Paciccio strops. Just browsing around the forums and found this.